From my experience towards the end of last year, I'm now very aware not only of what overreaching feels like, but also why it is bad.1 No longer am I going to try to push through; this was supposed to be my final Pre-Season Build week, with a recovery week to follow, but if I'd continued I would have just ended up doing mediocre intervals and building up unnecessary extra fatigue. Out of all the changes and improvements I've made to my training plan since I first started working on it last spring, probably the most important was adding an emphasis on flexibility. A pre-designated training block is just an ideal, based around specific goals, which you can stick to only if everything goes right; the real world has a habit of interfering with the best-laid plans, in all kinds of ways, and it tends to punish you if you ignore it. So I bailed out of my intervals on Tuesday, took an extra day completely off the bike on Wednesday, and just did easy recovery rides on Thursday and Friday. I also cancelled my Tuesday, Wednesday and Thursday weightlifting sessions. Recovery means recovery! Near the end of the ride on Sunday; the fast riders have all gone home! Funnily enough, when I woke up on Saturday my legs felt heavy, my HRV app said I needed a rest, and out on the bike I felt flat, rather than fresh. I'd felt full of energy earlier in the week, too! However, I decided to stick with my planned ride: 3 hours solo, with several 30-second anaerobic intervals and a few extra short sprints. About halfway through the ride I felt like things were improving, and I even ended up getting a couple of Strava KOMs. Not bad for my first anaerobic session since last autumn. On Sunday I actually felt much fresher than I had on Saturday, despite the fairly intense ride I'd had the previous day. 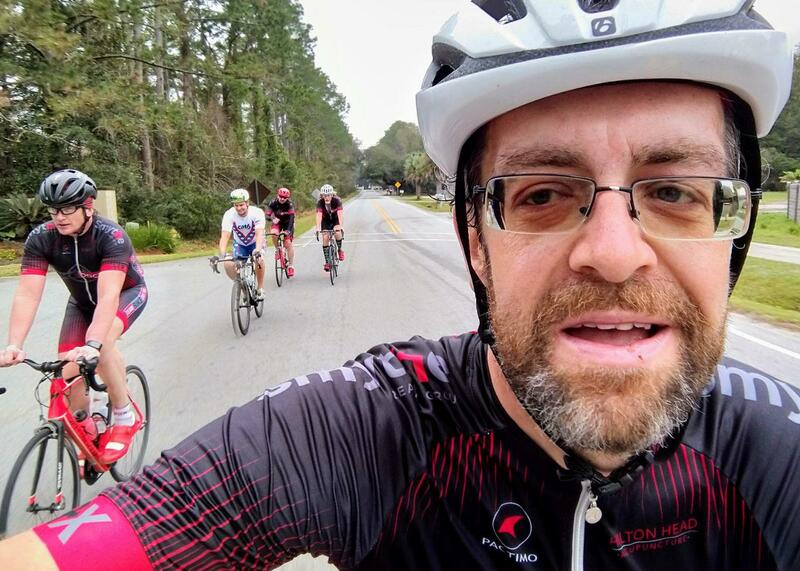 It was a group ride on the Island, a little foggy early, but no wind and mild temperatures. A few faster riders have started to awake from hibernation, and now that we're into March people are more willing to up the pace a little. I did some solid efforts, including a fast 3-man break down the length of Marshland, halfway around the main ride loop. I bridged across to Gary, who (as he often does) had gone for a solo breakaway coming off the cross-island bridge. A third rider went with me, and the three of us managed to keep a good 100m gap in front of a hard-chasing larger group behind for the full 6 km (average speed 42.4 km/h, average HR 171). I skipped a few turns as I still wasn't feeling completely fresh, which provoked a minor controversy when I sprinted for the line! My best anaerobic effort happened earlier, going down to the first sprint point of the ride. On the latter stages of the run-in I was second wheel, behind Paul who reliably cruises along at 40 km/h in these situations. I was optimistically imagining that I might get to sprint from the perfect position, but with 800m to go Nick went flying past, going for a long one. I took a second too long to realize that Paul wasn't going to follow him (which I should have known), so I had to do a 300m effort going up to 55 km/h to catch Nick. Another 300m later Nick, realizing I was sitting on his wheel, peeled off, but before I could accelerate again Gary, who'd been following me the whole way, went on the counterattack on his other side where I couldn't immediately follow, so there was another gap to close with only 200m to the line. I caught him, but lost the sprint by half a bike length. This is what spring group rides are all about: repeatedly pushing yourself, getting fitter while having fun. My stats on that one: 60 seconds at 50.9 km/h, max speed 55.4 km/h, Strava-estimated average power 514 W, average cadence 111. My strongest sprint was actually after the main loop, 3 hours in, when there were only a couple of other riders left. I did 20 seconds at an average speed of 52.8 km/h, max speed 57.2 km/h, Strava-estimated power 630 W, average cadence 125 rpm. I'm happy with those numbers (and the ones above) at this stage of the year. Most satisfyingly, I felt great all the way to the line both times. I'm noting the stats here so I can follow my progression over the next few months. I want regularly to be hitting 60 km/h and averaging 55 km/h on a 30-second max effort. If I can do that, I won't be losing many group sprints when I get the tactics right. I've adjusted my saddle downward about 6-8mm, and that seems to have helped a lot, in terms of both comfort and power. I increased my medium-intensity riding this week, which I think has been something I've been neglecting recently (to my detriment). Next Saturday is my first ever gravel race, so I thought why not sign up for the full 100 mile version! I'll be taking my steel Jamis that I normally use to commute on, although I'm upgrading the wheels, and putting on some 35mm tubeless off-road tyres. I the meantime I want to do a few intervals during the upcoming week, but rein in the volume so that I can hopefully be fresh at the weekend. Actually, functional overreaching is what we're aiming for with each Build block. Ideally it will happen right at the end of the block, allowing supercompensation to occur during the recovery week, after which we are stronger than we were previously. If this overreaching occurs earlier than planned, it's best to modify your training accordingly.